Apr 27, 2018 @ 08:51 AM — by Sharon B. Mateja, D.D.S. You just had dental implants placed to replace your missing teeth. Now what? Knowing what to expect in the days, weeks, and months following your treatment can help alleviate worry and stress, and help you enjoy a successful recovery. Here, we discuss dental implant surgery recovery, and how our team in Rancho Cucamonga, CA can help you get back to normal life as soon as possible. Bleeding: When you leave our office, you will most likely have gauze placed over the surgical site. Leave this in place for approximately 30 minutes, and then remove it. More gauze can be placed if the bleeding has not subsided. However, if the bleeding has diminished, gauze is not necessary. You will continue to experience slight oozing and bleeding for the next 24 to 48 hours. This is not a cause for concern, and is a normal aspect of the healing process. Discomfort: Slight discomfort is a byproduct of any surgical procedure. However, most patients experience minimal pain. Any tenderness can be managed with over-the-counter pain relievers. Prescription medications may also be given depending on your unique situation. Be sure to follow the instructions given to you by your doctor. Swelling: Swelling is normal following dental implant placement. This will diminish with time. However, a cold compress can be applied to the external jaw in 20-minute increments for the first day to reduce inflammation. Oral Hygiene: Do not brush the surgical area; rather, gently rinse the area with antibacterial mouthwash. A warm saltwater rinse can also be beneficial during the first few days. Dietary restrictions: Stick with softer, cooler foods for the first day or two. Drink through a straw to avoid disturbing the surgical site. Additionally, try to chew on the opposite side of the mouth to avoid unnecessary tenderness. Activity:Patients recovering from dental implant surgery should avoid strenuous exercise or heavy lifting for the first 24 to 48 hours, as this type of activity can lead to increased bleeding, swelling, and discomfort. Typically, post-operative swelling will peak around the second or third day and should subside after that. Continue to follow the pain relief regimen recommended by your doctor. If absorbable stitches were placed, they typically begin to fall out after the first five to seven days. Begin gently brushing the surgical site when you are comfortable, preferably around the second or third day. Although every patient is unique and will heal differently, most individuals are comfortable enough to resume normal daily activities within the first week. 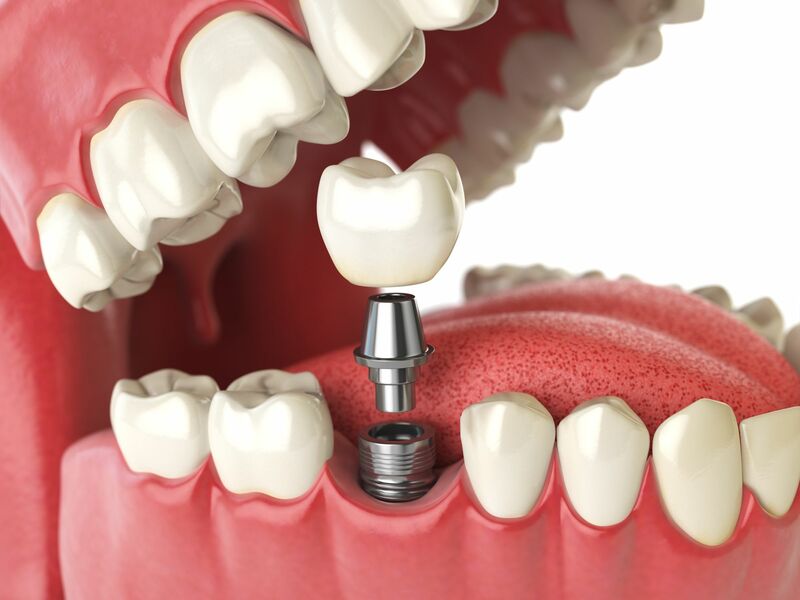 Once an implant is placed, it typically requires a few months of healing before the final restoration can be attached. During this period, the jawbone will fuse to the implant in a process referred to as osseointegration. Treatment timelines can vary, but on average, most patients can have the restoration added approximately three to six months after the initial implant surgery. If you are about to undergo dental implant surgery, or if you already have, understanding the healing process can help put your mind at ease so you can enjoy a quick, comfortable recovery. To learn more about the process, contact us online or call us at (909) 989-5959.